This autumn sees the 27th annual Ayr Concert Series, arranged by volunteers from Ayr Arts Guild for South Ayrshire Council, featuring three Scottish Orchestras and seven International Soloists. From Saturday 19 October to Friday 7 February 2014, six concerts will be performed in Ayr Town Hall and the line-up is once again stunning – with three visits by the BBC Scottish Symphony Orchestra, two by the Scottish Chamber Orchestra and one by The Orchestra of Scottish Opera. Music lovers will be thrilled with the wide range of concerts to choose from and, better still, the season ticket option that provides best value for money and ensures you don’t miss out on any of the evenings of marvellous music making. The opening concert on Saturday 19 October features the Scottish Chamber Orchestra in a programme called Romantic Landscapes conducted by Jaime Laredo, violin, and featuring his wife Sharon Robinson, cello. The atmospheric programme includes Dvorák’s Romance and Silent Woods, Saint-Saëns’ The Muse and the Poet, concluding with Mendelssohn’s Symphony No. 3 ‘Scottish’. On Friday 1 November, the BBC Scottish Symphony Orchestra, conductor Andrew Grams, plays Weber’s Overture Der Freischütz, Mozart’s Overture The Magic Flute and Wagner’s Symphony in C major. Leading British horn player Richard Watkins will join the orchestra as soloist in Richard Strauss’ first horn concerto. Thursday 19 December sees the BBC Scottish Symphony Orchestra return with their ever-popular Christmas Classics concert with conductor Stephen Bell and presenter Jamie MacDougall, tenor. Always popular is the Scottish Chamber Orchestra New Year in Vienna concert to be held on Saturday 4 January 2014. Nicholas McGegan is conductor and John Mark Ainsley, tenor, will perform a selection of well-loved songs by Lehár, Loewe and Coward, whilst the orchestra will play marches, polkas and waltzes, including Strauss’s Blue Danube Waltz. The Orchestra of Scottish Opera comes on Saturday 25 January with their new Music Director Emmanuel Joel Hornak, and soloist Anthony Moffat who will play Barber’s Violin Concerto. The concert will include Ravel’s Le Tombeau de Couperin, and conclude with Sibelius’s Symphony No. 5. The season reaches its climax with the BBC Scottish Symphony Orchestra conducted by Andrew Gourlay, and soloists Scott Dickinson, viola, and Yann Ghiro, clarinet. The concert opens with Mozart’s delightful Symphony No. 7 and Bruch’s charming Double Concerto for Viola and Clarinet, and ends with Tchaikovsky’s last Symphony No. 6 ‘Pathétique’. Councillor Bill Grant (pictured above), South Ayrshire Council’s Portfolio Holder for Economic Development, Tourism and Leisure said: “We’re privileged to enjoy a superb musical relationship with the Ayr Arts Guild and, once again, they’ve pulled out all the stops to organise a brilliant line up for autumn and into the New Year. 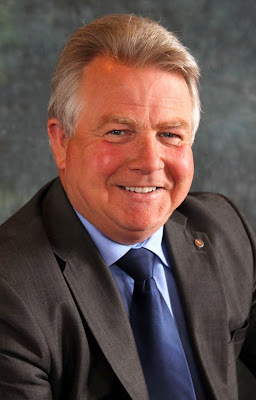 Jim Coutts, Chair of the Ayr Arts Guild commented: “We’re incredibly proud to have been involved in a unique and very fruitful partnership with the Council and Scottish orchestras, that now goes back more than a quarter of a century. “Together, we’ve hosted some of the most famous names in the business and the 27th series promises to be another successful season in Ayr Town Hall. Season tickets for the 27th Ayr Concert Series are now on sale by post from Ayr Gaiety Theatre, Carrick Street, Ayr, KA7 1NU and individual concert tickets will be available from Monday 2 September 2013. Brochures containing details of all concerts in the Ayr Concert Series 2013/14 are available in local libraries, leisure and tourist information centres. Councillor Grant concluded: “This year, more than ever, it’s almost impossible to choose which concert to go to as there really is something for everyone, so buy a season ticket now and make sure you see and hear them all! The Ayr Concert Series attracts investment from Enterprise Music Scotland supported by the National Lottery through Creative Scotland and support from South Ayrshire Council.